The Greenville wrestling team celebrated its team championship at the Miami Trace McDonald’s Invitational on Saturday. The Wave scored 280.5 points to win the 18-team tournament and had two individual weight class champions with Drayk Kallenberger at 113 pounds and Jacob Mikesell at 152 pounds. WASHINGTON C.H. 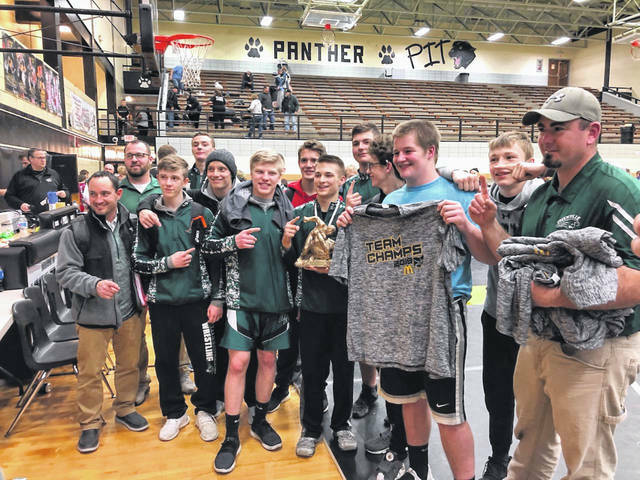 – For the first time in a while, Greenville claimed a team wrestling championship this past weekend at the Miami Trace McDonald’s Invitational. The Wave earned 280.5 points to win the 18-team tournament title staying ahead of Walton-Verona (Ky.) with 232 points in second place and Groveport-Madison with 216 points in third. Miami Trace and Warren tied for fourth place with 214 points and were followed by Logan Elm (213.5) in sixth place, Bellefontaine (212.5) in seventh place, Brookville (187) in eighth place, Wyoming (140) in ninth and Zane Trace (126) in 10th place. Rounding out the rest of the field was West Carrollton (114) in 11th place, Adena and Madison tied with 98 for 12th place, Chillicothe (73) in 14th place, Paint Valley (48) in 15th place, Circleville (42) in 16th place, Unioto (41) in 17th place and Taylor (24) in 18th place. Greenville was led by a pair of individual champions and a number of other placers. Winning individual titles were Drayk Kallenberger at 113 pounds and Jacob Mikesell at 152 pounds. Kallenberger defeated Isham Peace of Walton-Verona by a 7-2 decision for his title, while Mikesell earned a pin win over Adena’s Dalton Metzger in 3:41 for his championship. “I am very proud of everyone who wrestled this weekend,” GHS coach Dave Guillozet said. “They all contributed to help win this tournament. It was a total team effort and I was very excited for our kids and coaches. Hopefully, this success will continue through our league and postseason tournaments. Several Greenville grapplers earned runners-up medals in their respective weight classes. At 106 pounds, Andrew Stachler came in second after losing to Spencer Moore of Walton-Verona by a major decision 17-6. At 138 pounds, Dean Hurd finished second after losing a 13-3 major decision to Miami Trace’s Mcale Callahan, and at 220 pounds, Tytan Grote finished second after losing to Bellefontaine’s Bruno Pattison by pin in 3:49. Riley Slade took home a third-place medal with his pin win over Madison’s Logan Jordan in 3:23, while both Jacob Goldsmith (145) and Zane Mancillas (170) won their fifth-place matches. Goldsmith defeated Brookville’s Devon Myers by pin in 2:04 and Mancillas pinned Isaac Evans of Circleville in 2:59. At 285 pounds, Colton McCartney finished in sixth place on the podium after falling to Groveport-Madison’s Tykel Hancock in a 7-2 decision, and both Logan Thatcher (120) and Michael Cline (132) took home seventh-place medals for the Wave. Thatcher defeated Miami Trace’s Devin Seymour by pin in 3:18 and Cline won by default against Circleville’s Lucky Donaldson.